It's the day after Christmas and I'm looking at 10" of snow on the ground so while I'm snowbound with no more plans for the year, it is time to reflect on what has been another fantastic year in my life. 2009 had been a re-building year with my focus on cross-training and preparing for Ironman but after that event my focus returned to running with a long range plan of returning to the Boston Marathon in 2011. Karla and I had agreed that once she was again strong enough , we would return one more time and so now that we were both healthy it was time to focus our training on that goal. I began the year off with a good start running a strong 5k on Jan. 1st at the Resolution Run. I followed up a week later with a 50k Pr at the Salem Lakeshore Frosty Fifty K on a frigid morning. Not bad for a 54 year old with 50+ ultra's under his belt. The day was made even more special by making the trip with 3 of my Angel Team, Karla, Lisa and Jenn. Now the focus would be on training for our Boston qualifying attempt. Over the next two months there would be no racing but many long runs and nights running in the cold and dark on track nights. One particular workout stands out on March 2. It was 35F, raining and the wind was blowing 20mph with gust up to 30mph yet Karla and I got out in it and ran 6 x 800m. Lisa was with us on all of our weekend long runs and finally the test would come at the American Tobacco Trail Marathon on March 21st. It was a perfect day for the race and all three of us would qualify as I ran my fastest marathon since Feb 2006. Now with the pressure off to qualify I could focus on just having some fun over the next several months. 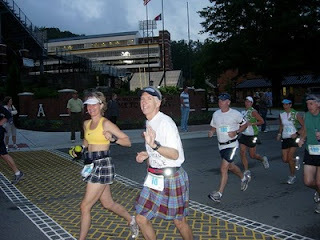 In April I ran the Tarheel 10 miler for fun with Karla and she ran a pr. Then two weeks later I traveled to Asheboro with Karla and Frank to run the 5k there where I ran a good time and won my age-group. 2 weeks later on May 2nd it was off to Cincinnati with the Werners and Jerry for the Flying Pig Marathon. I had a disappointing race but a fun trip. Followed that up a week later and ran a 21:33 5k in Garner which was my fastest time in a few years. On June 12th I returned to The Bethel Hill Moonlight Boogie for the 50 miler. Despite one of the hottest years ever, I was able to complete it for my longest run in over two years. On July 10th I had probably the most fun of the year making the trip to Grandfather Mountain Marathon accompanied by by my wonderful team of Angels, The Marathon Princess, Mountain Girl and Ultra Angel. This would be a special year as I planned to do the first Grandfather Mountain "Double" Marathon. 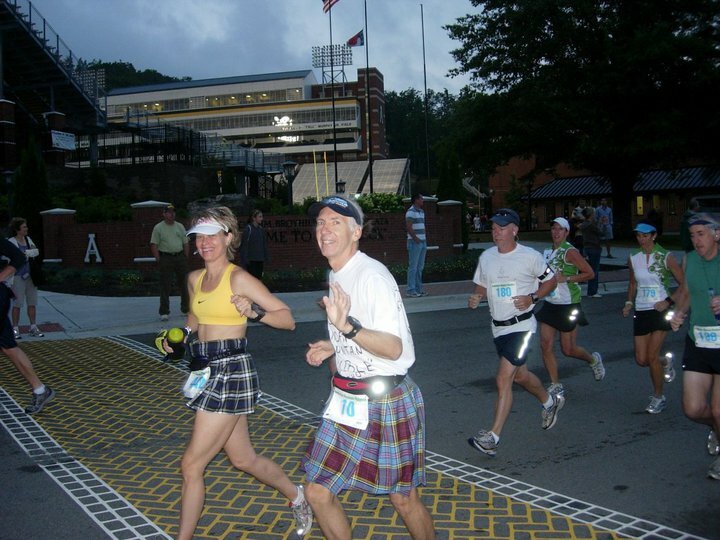 I would run the race with Karla in 4:56 and then run back to the start in Boone with Jenn. Lisa and Karla would crew for me on the return trip which I completed in 11:33 to be the first person to ever do it. Woohoo , a world record ! Now once again it was time to begin focusing on preparing to get in the best possible shape over the next few months with the long range goal of running fast at Boston next April. The remainder of July was for recovery and then training through August. On Sept 12th I made the trip to Allentown PA for the Lehigh Valley Marathon with the Werners. We had a great trip and I ran my 2nd fastest marathon ever in 3:44,another Boston qualifier. Returned to the Selma Railroad Run 5k in Oct and was 2nd in my age group in a fairly good time of 21:57 and then a week later made the trip with Karla and Lisa to the New River Trail 50k. Not my day but it was a beautiful day on a lovely course and a great race by Annette Bednosky and her crew of volunteers. 2 weeks later I would have my longest mileage training week ever at 102 miles. Then in November I returned for my 4th OBX Marathon. Another disappointing outcome but another wonderful weekend with friends , the Howells and Werners. I finished up my racing year with a good time at my 7th Derby 50k running 4:55. Overall a very good year and I am so fortunate to have some wonderful friends and training partners to share it with. But besides running this was certainly a FANTASTIC year personally as I was Blessed with the birth of two beautiful Grand-Daughters, Aurora Ann on Feb 11 and Rachel Marie on Dec 18. Now that is something to look back on with pride and joy !! Great year! Lot of accomplishments!